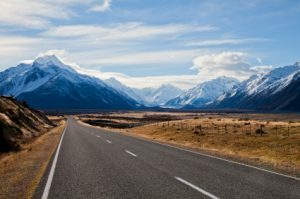 What better way to see New Zealand than to strike out on the road with a camper van or Motorhome? Enjoy the freedom: you choose where and when you want to go in the comfort of your hired camper. In a country renowned for its natural beauty, hiring a campervan in New Zealand allows you to get as close as possible to magical wildlife and the awe-inspiring scenery. With camper hire New Zealand you don’t have to worry about leaving anything out on your holidays: you can drive your van between snowy mountains and gorgeous beaches, from remote hiking trails to placid lakes. On the North Island, imagine starting the day among the flora and fauna of the spectacular Rainbow Springs Nature Park, and then being whisked away to another world to visit the fantastical set of The Lord of the Rings trilogy. Next morning you wake up in the comfort of your own bed, make some breakfast, look out of the window and remember where you are. New Zealand’s striking mountains rise up on every side of your campervan, and you are surrounded by tranquil nature. Whether you are a seasoned adventurer or setting out to explore NZ for the first time, motorhome hire in New Zealand lets you see these beautiful islands like no other holiday. Visit the South Island and be entranced by the fjords, bays and glaciers. Hiring a motorhome you can choose to spend a day moving at a gentle pace between magnificent sights. Or choose one destination and you can leave your recreational vehicle RV for a day and enjoy a new activity New Zealand has to offer. Roll into Canterbury and take a balloon to view the serenity of the air, or stop in Tasman Bay and get wet on a kayak. When you get back to your RV, you can relax in the comfort of your own space – without even having to think about finding your way to a hotel, and without the additional expense of new accommodation every night. If you are looking for a family holiday or want to get away to enjoy time with a group of friends, hiring a recreational vehicle will suit all types of holidaymaker. New Zealand’s excellent camping parks offer a great range of facilities for children and adults alike. You’ll see New Zealand in a way that no other holiday can show you. Spread out from your vw campervan and have a barbecue under the clear blue sky. Watch wildlife from your window. Stop in a camper park to meet up with other campervan holidaymakers – or, if you prefer, you will find it the easiest thing in the world to pick a site where you will have nothing for company but yourselves and spectacular natural beauty. Campervan hire is the no hassle way to explore New Zealand with complete freedom. Book your van online or call your booking agent today.